M&A are a popular abaya brand in the UAE, who often take part in fashion shows such as the Dubai Summer Surprises. Here are a few photos of their collection. Any favourites? It's so beautiful I want this abaya!!!! Where can I buy this abaya???? i wish we could purchase these from somewhere. i need help ive got a mehndi to go to 2morow, and i am wearing a royal blue jilbab, its got a small bit of silver embroidery, i have no idea what colour scarf i should wear with it and what colour bandana. These abayas are in principle all the stuff of dreams. I like the last one, the two in the top row and the one in the second row on the left the best. Anonymous, I'd go with a royal blue scarf and silver underscarf. For a more radical look, you could try a contrasting hijab and accessories. For example, there's a certain shade of orange that I somehow associate with mehndi party wear, and you could do that for the hijab (with a royal blue underscarf), and have a nice, soft leather bag in the same color. Probably you want to go with solid colors in both cases, so as not to compete with the silver embroidery. But the shoes could be, for example, decorated with beadwork in that shade of orange and royal blue. gorgeous collection...... where to find these abayaats please give some clue if you have. yellow scarf with royal blue bandana plus silver hijab pin would go nicely with your outfit. Well to be honest, I don`t really like `em. 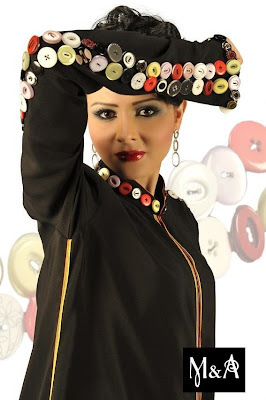 I like clothes that stand out..
Wow, I really like these abayas and I want to buy some!! Amazing feminine flowing abayas,,,look so fun and fab to wear..want one or three! these abayas are beyond amazing. but i wonder, when is it appropriate to use the abaya (esp for someone not in the UAE)? because i remember my aunt used it when she was in the UAE only. i apologize for that question but im still reading and learning about Islam and everything related to it nowadays. it's a beautiful outfit, actually. I want them all.. How can we order? does anybody know how?